Here is a List Of Best Free CD Cover Maker Software For Windows. All these software help you design and create attractive CD covers. These CD cover maker software let you customize CD covers with your own image and text. Some of these CD cover maker software can design cover for various types of Disc types such as: DVD, Business card, Tray card, Mini Disc, Biz Card, Cartridge, Slimline case, Floppy Disk, etc. This article will explain you how to create CD cover, how to design CD cover, how to Print CD Cover, and how to design batch CD covers. Here, you will learn to make your own CD covers. You can use image, digital photos, text, CD cover templates, Patterns, colors, shapes, clipart, etc. You can also use images of different formats and resize them as per your need. Text can be use of different font style, font size, color, effect, alignment, etc. Some software support multiple CD Cover designing. You will find that some word processors can also be used as CD cover maker. These word processor have almost same features as dedicated CD cover makers, like options to add image, colors, text, shapes, templates, clipart,etc. If you want to maintain your collection of CDs with your own personalized CD cover, then read out this article, choose any of these software, and make your own CD covers. I like UnderCoverXp the most out of all CD cover maker software. I like it because of its simplicity, and it comes with many interesting features. You can create designs for CD covers in batch. It lets you create not only CD covers in batch, but many other templates. You just have to add image for each CD or DVD covers. With few simple steps, you can create multiple disc covers of multiple disc types together. Check out these List of Best Free Stop Motion Software For Windows, Best Free Websites To Download Free PowerPoint Templates, and Best Free Flowchart Software For Windows. UnderCoverXP is a freeware to design DVD covers in batch. You can design as many CD covers as you want. There are various layout designs available as well, such as: Jewel cases, CD label, Mini Disc, Slimline disc, etc. Select a CD cover template from Template list. You can design Front, back, and inner of the CD cover. Select image if you want to create single CD cover, other wise click on Batch Print. Select multiple images to design multiple CD and DVD covers. Number of Output DVD covers are equal to number of images you add. You can also select different templates other than CD and DVD covers. 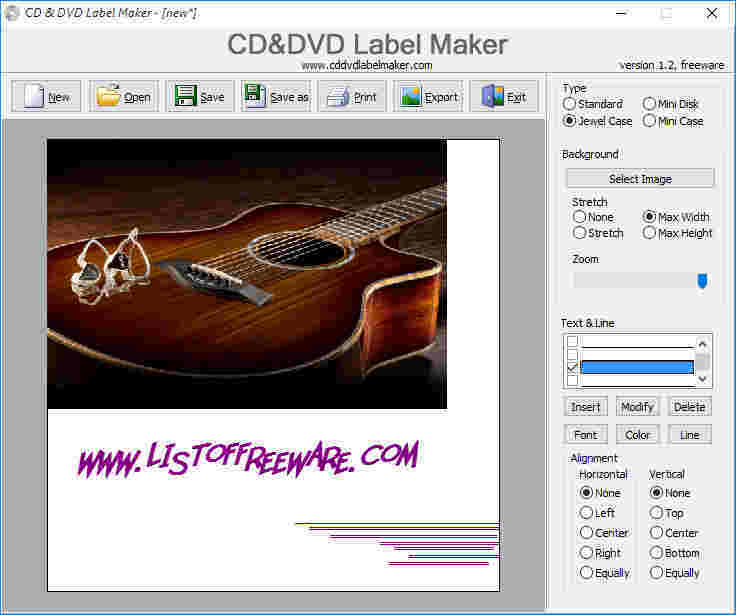 Free DVD Label Maker is a free CD cover maker software. It can create Cover and Label for a disc. You can create jewel cases, mini disc cover, disc cover, and tray card. Select DVD label type. You have to choose Traycard for CD and DVD cover design. Choose image or color to fill background. Adjust image size by Stretch drop down list. Customize DVD cover with your own words and designs by adding text, lines, and shapes. You can also draw outline for Disc cover. Use Print or Save icon to print or save your CD cover design. Nero Cover Designer is a Freeware for CD cover Designing and CD cover printing. This DVD cover maker software lets you design CD cover with lots of pre-loaded designs and patterns. Open Nero Cover Designer software. Select any design or image from your PC. Add Text, Artistic Text, Line, Rectangle, circle, and many other tools. Print or Save your design. You can save any image of your PC as template in this CD cover maker software for use in future. It supports many image formats, such as: JPEG, PNG, BMP, PPM, PBM, etc. It lets you create CD cover and label for a number of Disc types, such as: DVD, Mini Disc, BD Case, BD Slim Case, Slim Pack, Maxi CD, BD Case, Biz Card, etc. You can customize CD with Titles, Artist, Disc Type, Number of tracks, Disc Title, Disc Artist, etc. Text can be used with different font styles, font colors, font size, etc. You can also use Artistic text, Digital photos, and various shapes, such as: line, square, rectangle, polygon, etc. Disketch Disc Label Software is a free cross platform software to make CD cover, available for Windows and MAC. Here, you can design label, front cover, back cover, and standard case for CD, DVD, BluRay Disc, and many other Disc types. It has options to add clipart and frames. This CD cover maker lets you share your designs on Twitter, Facebook, google+, LinkedIn, and StumbleUpon. Select File>New>CD/DVD/Bluray Disc case on generic paper. Choose whether you want to design Front case or Back case. Use color, image, or gradient effects for background. Add text, clip art, and frames if you want. You can add CD Info like artist name, album title, track list, etc. Use Print option to print your designed cover. This freeware is available for free only for personal use. To use it commercially, you need to purchase this software. CD&DVD Label MaKer is a free CD cover maker and CD cover printer. You can design cover by choosing Jewel case, or Mini case. Customize your cover as per your choice by adding text, images, lines, etc. You can use images of JPEG, PNG, GIF, etc. formats. Text in various font style, font color, font size, effect, alignment, etc. can be used. Print or save your design by respective options available on the main interface. Disc Studio Labelling Software is a free CD maker software. Select any layout to design CD cover from existing templates. You will find many other layout designs other than CD and DVD cover and label, such as: Mini Disc, Blueray Disc, Traycard, Jewel Case, Nitro Mini, etc. You can use background color, image, inbuilt pattern, designs, etc. Browse image from your PC for background image or use inbuilt designs. It supports various image formats, such as: JPEG, PNG, GIF, TIF, TIFF, WMF, etc. It has lots of tools for editing, like: halo, arc, arrow, ellipse, round rectangle, rectangle, polygon, free hand tools, etc. You can add text in various fonts, font size, font effects, font color, etc. Save output as image in JPEG, PNG, and BMP formats or print it. DRPU Card And Label Designer is a freeware to make CD cover. It can design Standard CD, Mini CD, Rectangle, Round rectangle, and Ellipse. It lets you add text in various font styles, colors, effects, and sizes. You can insert images of formats: JPG, PNG, BMP, TIFF, GIF, EXIF, etc. It also has options of adding bar code, clip-art, various shapes, grid lines, etc. Note: Its free version adds a small watermark on the design. 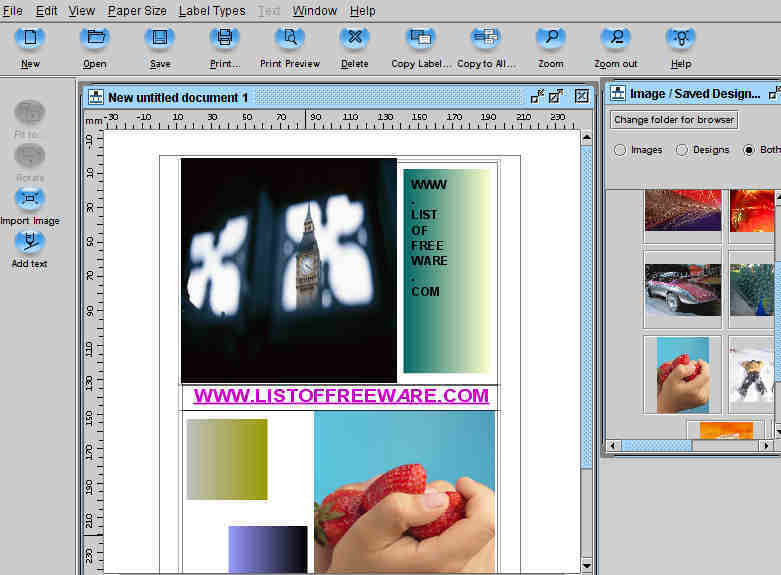 exPressit SE is a simple and free CD cover maker software. You can create covers for many disk types like CD, DVD, Floppy Disk, Blu Ray Disk, Business Card, Cartridge, Mini Disc, Jewel Case, etc. It lets you add image and text. You can use image from its collections or browse from your PC. Text can be modified with various font style, font size, color, etc. So it helps you to design, preview, save, and print your CD cover. CoverCreator is a simple freeware to create and design CD and DVD cover. This CD cover maker software is of small size and contains few options to design CD and DVD covers. You can create standard CD jewel case, standard DVD case, slimline CD jewel case, and Slimline DVD case. There is no option to insert any image and you can add text only at specified position. Here, you have to choose Front cover and Back cover options, where you can add text. Save and Print options are available. It can save a cover design as CoverCreatordocument format. Brainative Disk Label Designer is a simple CD cover maker software and CD cover printer. It incorporates few but sufficient options. You will find four layout options: Standard, Mini Disk, Jewel Case, and Mini Case. Jewel case lets you create standard size CD cover and Mini case lets you design cover for Mini disc. You can fill background with color or image from your PC. It has options to insert any image and text in various styles, such as: font style, font color, font size, font effect, etc. After completing your cover designing, you can save it as a BMP image or print it. AVS Cover Editor is a free CD and DVD cover maker software. Here, you can design front and back Disc covers using image and text. You can use already available designs and templates or can browse images from your PC. Use image or color to fill background. You can also add image, CD cover template, and text. Opacity of images can be changed according to percentage. You can use text in various colors, width size, font size, font effects, etc. Insert Grid of different size and colors. 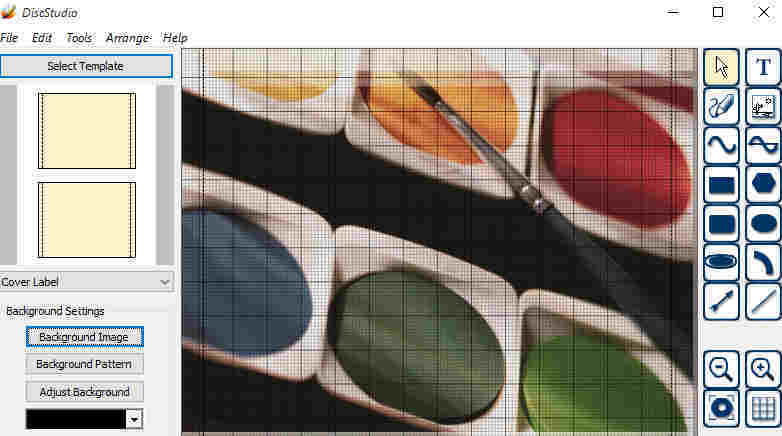 Use various shapes of different size, colors, and opacity level. LibreOffice Writer is a freeware to make CD cover. This is a word processor software which can create attractive disc cover designs using templates. You just have to download templates. Download templates for CD and DVD covers from here. Open this templates in LibreOffice Writer. Design your own CD and DVD cover with image, text, shapes, colors, etc. Print or save your design on your PC. OpenOffice Writer is an another word processing software which lets you create CD and DVD covers with your own image and text. Lets see how it creates CD covers. Open templates through File >Open. Customize this template with images, colors, text, etc.